We all know that Fyre Festival crashed and well, burned. There has been a lot of talk about the value of influencer marketing emerging from the ashes of this doomed, disaster fest. Celebrity influencers backed the Bahamas fiasco and encouraged unwitting Millenials to dish out thousands for a festival that turned out to be…nothing, really. Now, people are blaming influencers as a whole for what happened, and are starting to doubt the value of influencer marketing altogether. But not so fast. Without a doubt, brands and businesses large or small can still benefit from integrating influencer marketing strategies into their PR and marketing mix. Here’s how to do it the right way. “The key is finding authentic ways to engage, add value and bring meaning to the experience for everyone involved.” Katie Pringle, Head of Integrated Marketing and Co-Founder at Marigold Marketing & PR. Chopped Canada winning Chef Stephanie Brewster opened Fuego Tapas Bar, a hot new restaurant in Oakville, Ontario. Stephanie and her husband Shawn loved the idea of hosting an event where the local media could taste the food and experience Fuego. Here’s where Marigold, and influencer marketing came into play. Marigold recommended and executed a highly successful media and influencer day. A guest list of 20 key local foodies, bloggers and food writers were invited, ensuring we reached Fuego’s market. These influencers filled the restaurant. The crowd joined Chef Stephanie and CHCH news anchor Lesley Stewart to experience delicious tapas and infamous sangria. Interviews with Chef Stephanie were made available to all interested bloggers and media. Made-for-Instagram moments were key. Passed bite-sized samples of signature dishes like crispy duck breast, cauliflower puree and figs stuffed with manchego cheese and wrapped in bacon ensured everyone (and their followers) left happy. Dishes were displayed across the restaurant featuring the gorgeous food styling Chef Stephanie is known for. From iPhones to pro-photography, not a moment of the event was missed. Adding to the atmosphere was live music, interviews with Chef Stephanie and great grab bags, including Fuego’s hugely popular candied bacon. 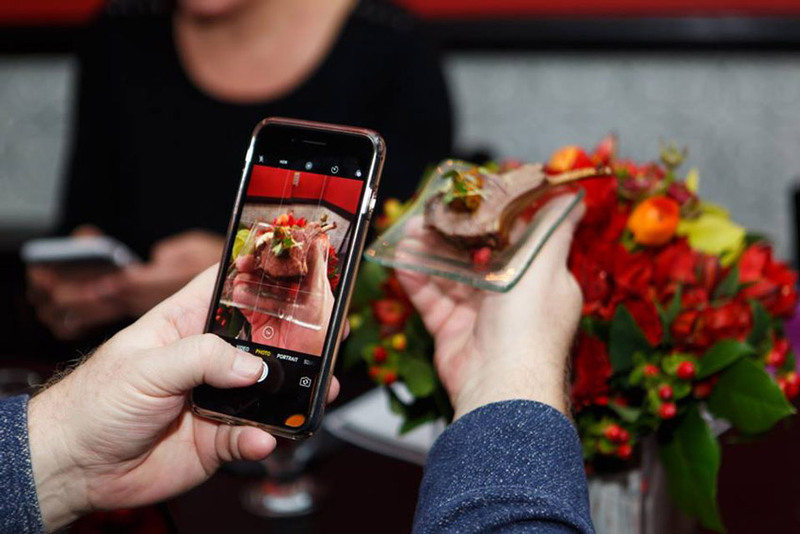 Live at the event and behind the scenes the Marigold social team engaged with all the guests, encouraged social sharing and created shareable moments where possible. Fuego saw over social 100 social mentions, 260 engagements coming out of event content, resulting in a minimum of 160,000 targeted impressions. Fuego was also featured in YP Dine with a glowing review, and across local media including Snap’d and Living Oakville. Blog features included The Food Sisters, Spicy Olive and The Joyce of Cooking.